Located just 30 minutes from Boone, North Carolina and nestled in the Blue Ridge Mountains, Watauga Lake holds the distinction of being the highest reservoir (more than 1,900 feet above sea level) in the Tennessee River system. Surrounded by the Cherokee National Forest and flanked by the Appalachian Mountains, Watauga Reservoir is arguably the most scenic in the Tennessee River watershed. It offers access to the Appalachian Trail. Below Watauga Dam is a wildlife observation area where visitors have a chance to view unique species of waterfowl. 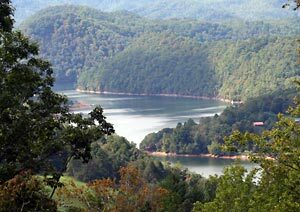 Watauga Lake has 104 miles of shoreline, and 2 miles of island shoreline giving a total of 106 miles of shoreline. The maximum width of the lake is 313 acres with a surface area of 34,200 acres. Watauga Dam is 318 feet high, and 900 feet long and is located on the Watauga River mile marker 36.7 in Carter County. The reservoir is 16.3 miles long. Wakeman Realty has handled hundreds of lakefront properties including spacious vacation homes with private access to the water and wooded lots with acreage and mountain-top properties with majestic views over our last 40 years in business.